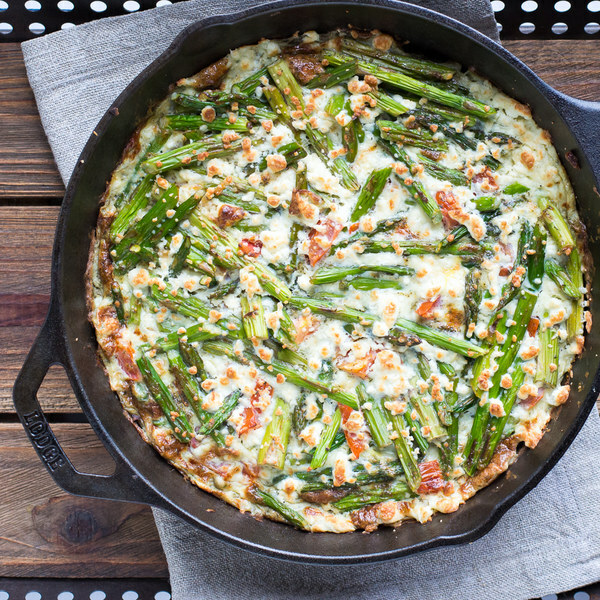 ← Asparagus, Tomato & Feta Frittata. Peel and mince garlic. Wash asparagus and snap off woody ends. Cut diagonally into 2 inch pieces. Wash and medium dice tomato. In a medium bowl, whisk together eggs, water, dill, salt, and pepper. Set aside. Coat bottom of skillet with oil. Add garlic and cook until fragrant, 15-30 seconds. Add asparagus and cook until tender crisp, 2-3 minutes. Pour in egg mixture. As eggs set around the edge of the skillet, gently lift cooked portions with a spatula to allow uncooked egg to flow underneath. Cook until bottom and sides are firm but the top is still runny, 8-10 minutes. Sprinkle feta over top. Place skillet in the oven under the broiler until the top is set, 2-3 minutes. To serve, cut frittata into wedges and place on a plate. Enjoy!